Autumn Is Gutter Cleaning Time! There’s no doubt… the colour of the leaves on the trees are great this time of year. Changing their colour from greens to shades of browns and yellows. Nature is a wonderful thing. The leaves fall to the ground, get blown around by the wind. Go back into the earth or fill up your gutters. Gutters that are not cleared of autumn leaves and debris can become blocked. Blockages can lead to overflows, flooding and pooling of water in your gutters which can eventually lead to the rusting and decay of your gutters. Gutter cleaning is a part of regular house maintenance. Since roof guttering is way up high, we all tend to forget about the gutters and the important role they play. 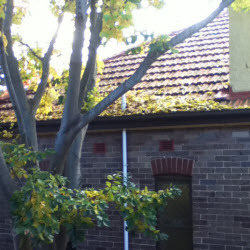 Image a house without roof guttering and down pipes? By the way… do you use tank water as your main drinking water supply? As you know, the water that flows into your water tanks is from your roof and guttering. To maintain a healthy water supply in your water tanks. Autumn is the perfect time to have your gutters cleaned before the winter rains. Gutter cleaning is also critical as vegetation and leaf debris is a potential fire hazard… as it adds fuel to a fire. Call Peter on 0410 630 433 or use our Free Quote Form to arrange to have your gutters cleaned by Exterior House Cleaning Sydney and Central Coast.